The grandchildren of the John A. and Mae B. 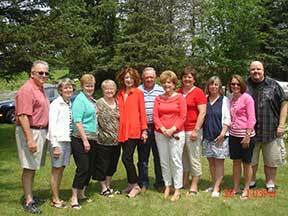 (Carolan) Cronin family gathered in Decorah the weekend of June 29 and 30, to celebrate a wedding anniversary, birthdays and a graduation. They are the children of Harold (Muriel) Cronin, Mary (James) Henry, Myles (Maxine) Cronin and John (Verna) Cronin.